The Foreign Ministry has welcomed the idea of allowing embassy staff to observe the general election but not non-residents or foreign organisations. Minister of Tourism and Sports Weerasak Kowsurat said this weekend that Thailand has initiated a number of measures to better balance, manage, and distribute visitor numbers and preserve the quality of tourism destinations in Thailand. A former Pheu Thai MP was acquitted Friday of sedition and cybercrimes for questioning what happened to a historic plaque that went missing in April 2017. The National Legislative Assembly of Thailand (NLA) has accepted in principle the draft amendment Arbitration Act which would allow foreigners to serve as arbitrators in Thailand. Selection of senators, who will play a key role in shaping post-election Thai political future, began today with candidates in all 876 districts across the country selecting among themselves in their respective districts for preliminary lists of candidates to be moved up to provincial level for the second round of selection. Electronic campaigning, election campaign spending, and prohibitions on campaign materials are expected to top the agenda of a meeting between the Election Commission (EC) and political parties this week. Japan and China are working to improve ties through joint infrastructure projects abroad, but cooperation on a Thai railroad — a centerpiece of that effort — has already suffered. Thailand needs to make lifelong learning a national imperative to build a competitive workforce for the so-called disruptive era, as the formal education system can no longer “future-proof” degrees for the jobs of tomorrow, according to the South East Asia Centre (SEAC). The Royal Decree on the election of members to the parliament has already been submitted to His Majesty the King for his Royal approval, according to the Deputy PM Wissanu Krea-ngam. Security forces raided nearly 20 venues nationwide to shut down illicit operations streaming pirated films. Drivers in Thailand will no longer have to carry licenses after the Department of Land Transport (DLT) launches an electronic version of the ID in mid-January. Three Hmong men from Tak province have been arrested in Chiang Rai while allegedly attempting to smuggle 300 kilograms of crystal methamphetamine (ice) and 70 kilograms of heroin from Myanmar into Thailand. The US News and World Report has released this years University Ranks and Asia has only 63 high ranked universities and Thailand only had one, according to the recent report. Heavy rain that has battered the southern region for the past few days has caused flooding in Surat Thani, Nakhon Si Thammarat and Phatthalung provinces. Thailand’s Immigration Bureau chief Pol Lt Gen.Surachate Hakparn told a press briefing yesterday that Visa crackdowns in Thailand are here to stay. The site in Thailand where 12 football players and their coach were rescued from a cave has become a major tourist attraction. A former director general of the Department of Special Investigation (DSI) was found guilty of libeling former deputy prime minister Suthep Thaugsuban and sent to jail. Thailand’s cybersecurity spending is expected to grow 20-30% during 2018-19, driven by faster and more complicated targeted attacks powered by artificial intelligence (AI) and increasing use of the Internet of Things (IoT) in critical infrastructure and cloud security, says US-based cybersecurity firm Fortinet. Enterprise Asia, the leading non-governmental organization for entrepreneurship in Asia, announced 17 winners of The Asia Pacific Entrepreneurship Awards (APEA) 2018 Thailand at Bangkok Marriott Hotel Sukhumvit. An event on the safety of children has been organized in Phan Nga province. The focus of the event is the prevention of drowning which is the leading cause of death among children in Thailand. The Ministry of Public Health (MOPH) is taking a proactive approach reaching out to drug users, targeting to offer rehabilitation for 14,000 drug addicts over the next three months. China and Thailand on Sunday pledged to deepen bilateral cooperation and move forward the construction of the China-Thailand railway. A series of raids by officers from the Phuket Provincial Police has netted four suspects along with 1,006 pills of ya bah (methamphetamine), 63.99 grams of ya ice (crystal meth) and a handful of bullets – but no firearm. The Thai Orchid Exporters Association hopes to penetrate the Chinese market by cooperating with a company in the Alibaba Group to sell Thai orchids online. The Pollution Control Department (PCD) has issued guidelines for related agencies to achieve the country’s goal of eliminating 7.7 million tons of garbage within next year. Former United Nations Secretary-General Ban Ki-moon has recently visited Thailand to celebrate the official launch of Global Compact Network Thailand (GCNT) along with more than 500 business representatives from all manner of private industries. Although the military-led government has rolled out a raft of stimulus and relief measures to shore up the grassroots economy, spending and indebtedness among the underprivileged are still rampant. Deputy Governor of Rayong province Yuthapol Ongarjittichai has chaired the second forum on development plans for the area around U-Tapao Airport attended by Rayong Public Works and Town and Country Planning Official Capt Theerapong Krutdilokanon and other relevant officials. It seems the raucous media chorus calling for the installation of a homebred coach at the helm of the national football team has run its course and muffled a great deal. The Rajaprajanukroh Foundation under the Royal Patronage donated school supplies to 36th Rajaprajanugroh School in Phuket province. Thai side Chonburi won the title at the 2018 Belt and Road Colourful Yunnan International Football Tournament here on Sunday, beating Belgrade FK Zvezdara from Serbia 3-2 in the final. The Prime Minister has taken part in a walk rally along Prem Prachakorn canal honoring His Majesty King Maha Vajiralongkorn and His Majesty the late King Bhumibol Adulyadej, part of the Altruistic Heart: We Love Doing Good campaign. Thailand is on the brink of becoming the first Southeast Asian nation to legalize medical marijuana, a development that has pot connoisseurs around the world lighting up in anticipation. When poor people in Thailand queued to collect billions of baht in state-alloted cash handouts recently, critics accused the military government of using the exercise to raise the profile of its allied political party. The National Legislative Assembly of Thailand (NLA) has accepted in principle the draft amended Arbitration Act which would allow foreigners to serve as arbitrators in Thailand. Thailand and Cambodia agreed on Thursday to open four more border checkpoints and vowed to achieve their bilateral trade target. The building under construction on the coastal road to Krathing Cape, north of Nai Harn Beach, is legal, Rawai Mayor Aroon Solos has confirmed. Islam’s guiding council in Thailand has introduced new regulations requiring that marriages of children under age 17 be approved by a religious committee. The Government Pharmaceutical Organization (GPO) has delivered warm blankets and medicine to villagers in Chiang Rai’s Mae Fah Luang district, prepared 3 million doses of influenza vaccine for prevention of the disease in risk groups next year. Officials of the Department of Special Investigation (DSI) and police raided 19 venues in Bangkok and the provinces in a crackdown on illicit streaming of pirated films. The government is determined to improve the lives of persons with disabilities, turning Thailand into an inclusive society under the Pracharat or civil state approach. A formal complaint has been filed against a prominent Bangkok family alleging that they are refusing people access to public beach areas on Naka Noi Island, off Phuket’s east coast. 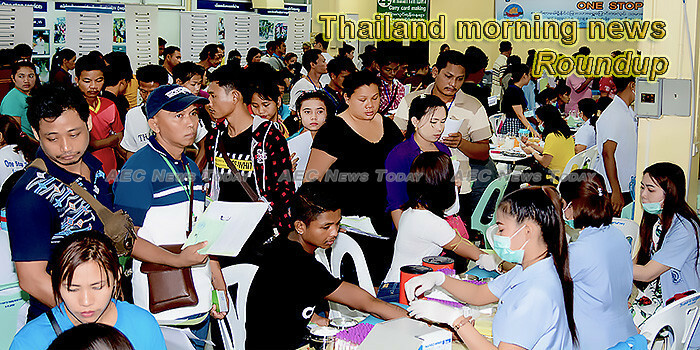 This week’s Thailand morning news feature photo acknowledges International Migrants Day, December 18.